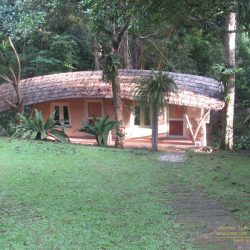 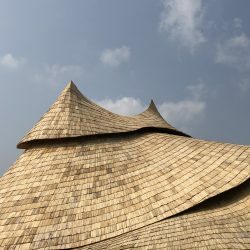 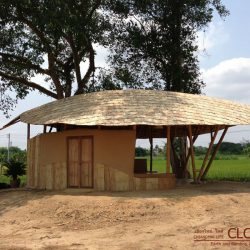 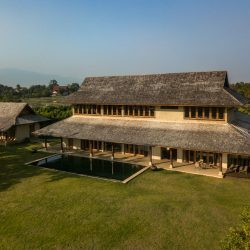 This half-open half-closed bamboo reception hall with a complex rolling bamboo roof in the form of a snake shell reflects an imaginative approach to bamboo architecture. 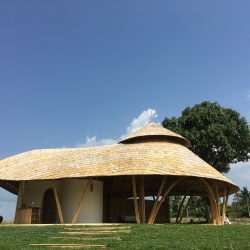 The bamboo reception hall welcomes parents and visitors at the entrance of Panyaprateep School. 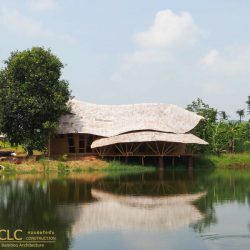 There is an open space with earthen and stone benches for sitting together in small groups, a small area with bamboo shelves where the school-made products are displayed and a small closed office space with bathrooms and a hand-made stone basin offering a comfortable environment to visitors of the school.